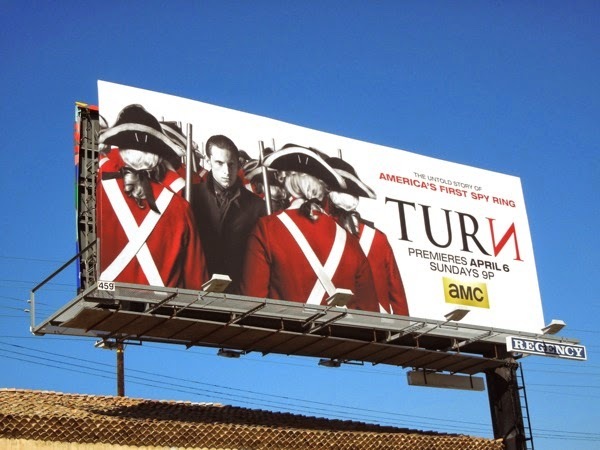 AMC's new historical thriller set during the Revolutionary War has big shoes to fill debuting in the same time slot as The Walking Dead, which has just enjoyed an epic season and record ratings. 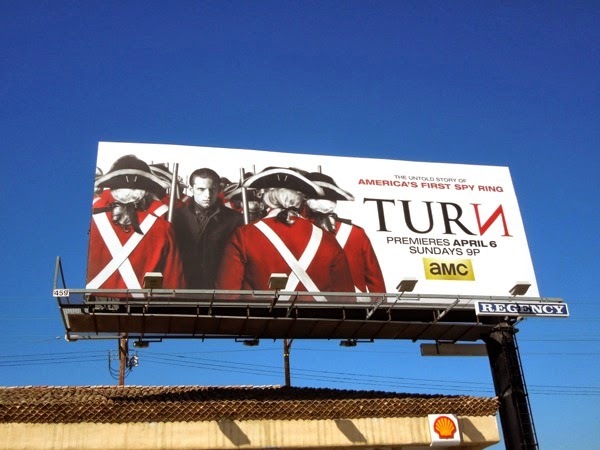 Can Jamie Bell as 'Abe Woodhull' in this untold story of America's first spy ring, based on Alexander Rose's Washington's Spies book, capture the audiences imagination in the same way they devoured the zombie apocalypse? 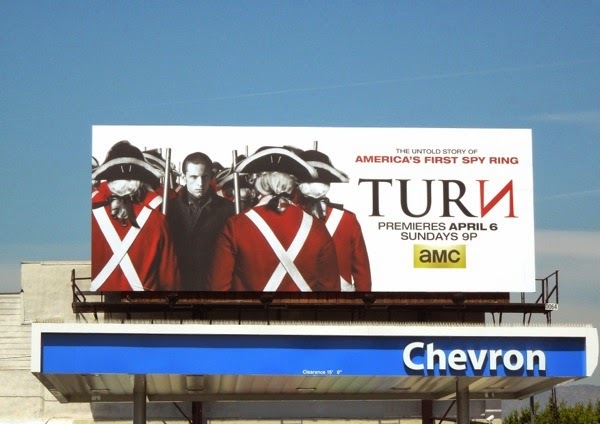 Get ready to be recruited for a secret mission to overthrow the British, as this simple New York farmer and his childhood friends turn against family and their king to form the Culper Ring to aid George Washington and his rebels. 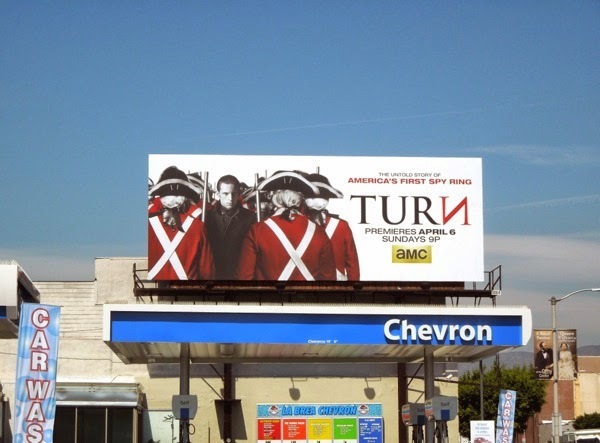 These striking series premiere billboards for Turn, with Jamie Bell facing the opposite direction to the occupying British redcoat forces, were spied along Beverly Boulevard at La Brea Avenue on March 12, 2014, and also a week later at the intersection of Beverly Boulevard and Fairfax Avenue. 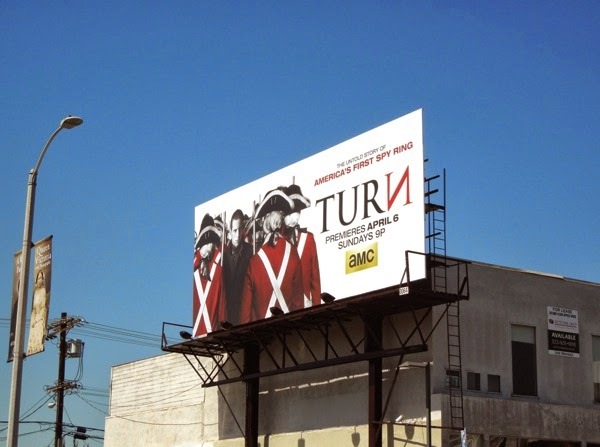 If you're a fan of the premium cable channel, be sure to take a look at these other billboard ads for AMC shows like The Walking Dead, Mad Men, Hell on Wheels, Game of Arms and more. And be prepared for some period espionage, fabulous costumes and wigs, plus no doubt a few surprises now that Billy Elliot is all grown up. (And if all else fails, there's always the fourth season of Game of Thrones starting over on HBO).